Recently I started a comic and began watching many youtube videos on how youmake a comic. In one video I saw someone talking about a online website they had made which could cut long panels into 800x1280 sections. I forgot to write down the website and was wondering if anyone knew the name of it *cries. I also have problems with placing the images in my comic, I can't seem to understand how you format a comic aesthetically and I also don't know what SFX are appealing as well as when and when not to have backgrounds to my panels. I was wondering if anyone could help me find the website as well as explain where, when or how I put images, SFX, and background. Ah yes, recently I've been talking with many artists and they all tell me to use "weighted lines" for drawing. I understand what they are, and why they are appealing, however I don't exactly grasp where you put heavier lines and where you put lighter ones. any time you change scene/location it's useful to draw a nice "establishing shot" panel, which is kind of a zoomed out background showing the new location. This helps orient readers to where the story is currently, and also locating your characters in the space. Aside from that, backgrounds should be used to show important information and elements in the surroundings. If there's an important door, or bush, building, or person, or whatever, don't be afraid to draw it in many/most panels. Backgrounds can also be useful for foreshadowing things. Be mindful of roughly how much text you're adding in. A lot of the panels that I skip background on, personally, are those where there's so much dialogue the background would be mostly obscured anyways xD no need to waste time drawing it when no one will be able to see it anyways. 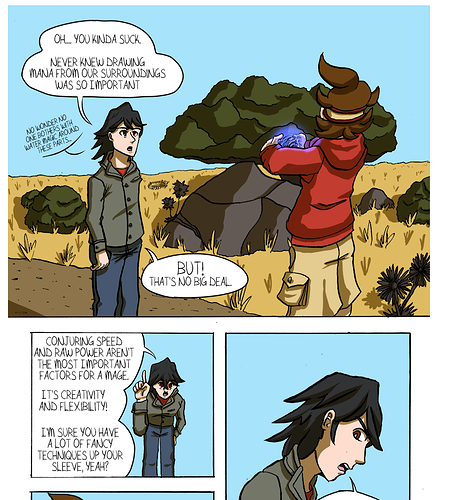 The top panel I drew in a full background, to show the spatial relationship of the characters and their surroundings. But the lower panels are pretty text heavy, so I decided not to draw in the BG. We know where they for this exchange so it's not strictly necessary. Also, thank you for the link. I'll be sure to check it out. Nice text bubbles. I was wondering, how do you draw text bubbles? I only have like 8 total comments on webtoons, but one of them is like "why are your speech bubbles so lumpy?" xD "because its s t y l i s h"
This is a broad subject. The how to place images (I'm assuming how to compose your panels?) that is. The panel composition, SFX, and backgrounds all depend on what specific story you're trying to tell. As a general place to start, I'd suggest you look at other comics that you admire and write down what they seem to do. Take note of what you like and figure makes for clear storytelling. Composing the panels and images within is about more then aesthetics. It's about what tells your story clearest. A general rule is the lines are thicker for areas that would have a shadow, need to be distinct from other things around it, or are heavier/thicker material. Thinner lines are used for things that are more delicate, closer to the light source, or made of lighter more airy material. This is a way to start thinking about it. A good way to practice is to just practice drawing objects around you and paying attention to how the lights and shadows fall and try to show that through line weight alone. Also if you like any manga or comics that do line work especially well, then it would be good to study those and see how they approach linework. Off the top of my head, the One Punch Man manga does an excellent job with their lines and would be an example of how to work with effective line weight of you're only working in black and white. However if you're working in color, then I don't think the line work has to be too dramatic. You'll still need it if the coloring is simple, but if there is a lot of "weight" added to the figures and objects through your shading then the lines weight variety can be even more subtle. 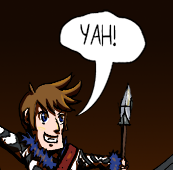 Also panel placement and speech balloons will be very different depending on if you do page format v vertical scroll. Okay, so with the gradients are their specific colors? for me I either have a gradient or solid color bg and the color I choose can be due to the mood, or just something similar to the actual color of the background. For example: I have a lot of panels in a school setting and they are often talking in the hallway, so for closeups of their faces I just have the color of the hallway wall as my bg in a lot of those scenes. but yeah a big part of it will be figuring out what you want. You gotta experiment and play with it and determine what you think looks good. And you can also reach out for feedback from other creators.